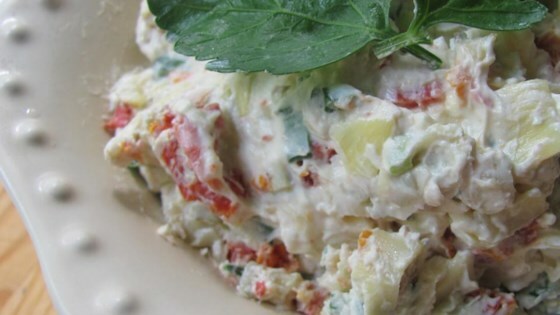 "A delicious appetizer that can be served at a fancy cocktail party or at poker night. Serve with crackers or toasted French bread slices." In a medium bowl, mix cream cheese, garlic and salt; stir and blend in artichoke hearts and olives. Add green onions, tomatoes, parsley and chives; gently mix together. Refrigerate for several hours or overnight to blend flavors; serve. This was a wonderful compliment to our meal-great starter. I substituted regular tomato for the sundried tomato cause it was just too expensive, but it still turned out great. I also left out the olives and added bacon. I prepared this dip for an office party and for my-inlaws. Everyone raved! I omitted the salt the second time because the artichoke hearts seemed to add plenty. A very tasty appetizer.